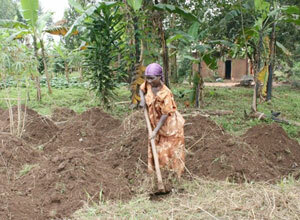 Increase income of local people by improving productivity and adding value to maize and beans. A large-scale project to achieve nutritional improvement of 1,200 families in three years has started. Since October 2017, Hunger Free World (HFW) has launched a new project to achieve nutritional improvement of 9,600 people of 1,200 families in three years through improvement of their lives. 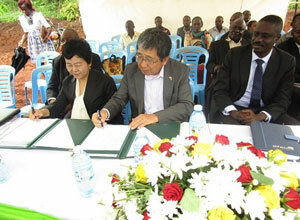 On October 19th 2017 we held a kick-off ceremony of this project with approximately 200 participants, including the members of the local cooperatives – the target of this project – and HFW staff from Japan office as well as guests such as the ambassador of Japan to Uganda, the State Minister of the target region, and people from local communities. 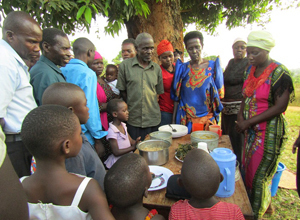 The target population is the members of the four local cooperatives in the following parishes: Nakkedde, Luguzi, Tumbaali-Lwemwedde, and Kabumba where HFW works. In these parishes, over 90% of the population lives on farming, and 72.5% of the households earn monthly income of 100,000 Ugandan Shillings (UGX, equivalent to 3,100 Japanese Yen, JPY as of November 2017), which is less than one third of the average income in the rural areas of the central part of Uganda. We aim to improve the livelihood of these people as well as the most vulnerable families who have not yet joined the existing cooperatives in the poverty-stricken region. Our project has several objectives: to increase production of maize and beans by 85% as they are both main food and cash crops of the target region, and to increase the annual income to the average of 2,000,000UGX for the target group including over 600 people currently in extreme poverty. 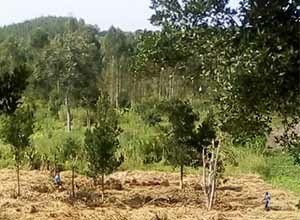 Provide agricultural machineries e.g. 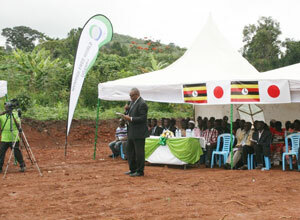 tractors to improve agricultural productivity. Build a maize mill for each parish and provide necessary equipment for the maize processing to add value to the maize grown by co-op members. Provide means of transportation such as trailer motorcycles to sell agricultural products through the cooperatives. Build offices as the base of cooperative activities to reduce fixed cost by cutting rental cost of the previous offices. Create system for co-op staffs to manage various equipment and machineries on their own and offer services such as tractor tilling and delivery service with fees for both co-op members and non-members. Provide adult functional literacy training including basic calculation so that members of the cooperatives can properly manage their family budget. Provide training courses to the co-op executives to build their capacity to manage cooperative activities and paid services so that they can continue the project even after HFW finishes the support. Normally we do not support physical capitals such as facility constructions and equipment supply, which consist of the large part of the budget of the project. The project is funded by the Grant Assistance for Japanese NGO Projects, support scheme by the Japanese Ministry of Foreign Affairs to assist Japanese international NGOs activities. The project was selected by reflecting various factors. First, the project meets the goals “1. 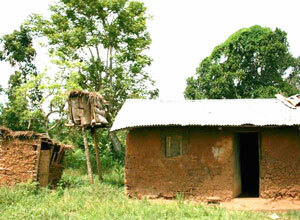 End poverty in all its forms everywhere”, and “2. End hunger, achieve food security and improved nutrition and promote sustainable agriculture of the Sustainable Development Goals (SDGs)” It also matches the Japanese government’s priority issues in international cooperation such as quality growth and human security, as well as the national plan of development by Ugandan government “to enhance marketing and distribution of agricultural products, focus will be on: developing capacities of existing farmers’ organizations, co-operatives and producer associations”. The budget from the Grant Assistance for Japanese NGO Projects covers 82 million JPY of the total budget of roughly 90 million JPY for the three-year project. In order to maximize and sustain the effect of this big-budgeted physical capital assistance that could not be done by HFW alone, we include capacity building programs for the local people that is HFW’s strength. My cooperative group originally started with 50 members in 2013, but now we have 163 members. Through this project, we aim to increase our members to 500 by the end of 2019. We must encourage people especially in extreme poverty to join the cooperative; families like 7 people living in 2 small rooms with animals in the house of straw roof. They can eat only 1 meal a day. We start from motivating them to work. When co-op center building was constructed, we no longer need to use the money for rent and use it for other productive purpose. It is a big gain. Also, we are planning to sell maize flour to hospitals, schools and government offices once we start maize processing. If we were just individuals we could not participate in bidding, but we can do it because we have been already established as a cooperative association with the support of HFW. We will work hard to make this project successful. I also consider that our issue is how to encourage the most vulnerable people to join the cooperative. In my parish, they misunderstand that cooperatives are only for richer people who can afford to save money. We need to change their mind-set. We will explain how cooperatives can benefit them to improve their life by giving examples such as seed on credit, of course, but I want to stress “mutual assistance” as the most important part. Not only economic improvement, but I also expect our capacity improvement through various trainings in the project. I wish I can visit Japan and learn how Japanese cooperatives are managed through my own eyes. YEH has launched a model farm as a first step to realize “the Right to Food” by gaining self-reliance as a farmer. 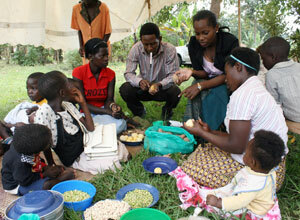 Local residents have started to learn nutrition improvement program spontaneously. 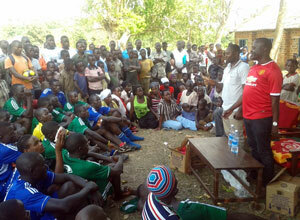 YEH National Committee Uganda has organized sports event. We introduced YEH’s activities to local youths.